For those who game, there’s no better processor than Intel’s Coffee Lake Core i7-8700K. Where its predecessor, the Kaby Lake Core i7-7700K, offered little more than slightly higher clock speeds and a way to decode DRM-laden 4K video over 2015’s 6700K, the 8700K boosts performance with six cores, 12 threads, and a mighty 4.7GHz boost clock, the fastest out-of-the-box clock speed Intel has ever produced. The 8700K handles content creation admirably, too, its high clock speed partly compensating for the two extra cores of AMD’s Ryzen 7. But it’s not an outright smash. Much like Intel’s Skylake-X i9 processors, there are signs that the 8700K was rushed to combat a resurgent AMD, as well as to fill the gap created by the now-delayed 10nm Cannon Lake architecture. Reaching such high clock speeds across six cores has dramatically increased power consumption and made managing heat a headache. Overclocking isn’t for the fainthearted or, at least, those without a substantial cooling setup. And, despite being based on an architecture that stretches back to Skylake, Coffee Lake requires a new motherboard, turning what might have been a compelling upgrade, even for Kaby Lake owners, into a far more considered purchase. The 8700K is undoubtedly a fine processor; those shopping for a mainstream system, particularly one with a top-of-the-line graphics card, should buy it. But, while more than a stopgap solution, Coffee Lake merely paints over the cracks that emerged when Intel braved its way into a post-“tick-tock” world. It’s damage control, not an outright victory. Whether we have AMD’s Ryzen to thank or whether it was part of the plan all along, Coffee Lake ends Intel’s quad-core limit for mainstream CPUs (albeit for a small bump in price). The entire i7 stack, which includes the overclockable 8700K, features 6C/12 at various clock speeds. But Intel didn’t stop there. The entire i5 range features 6C/6T, while the budget-minded i3 processors all feature 4C/4T. This is a huge improvement. 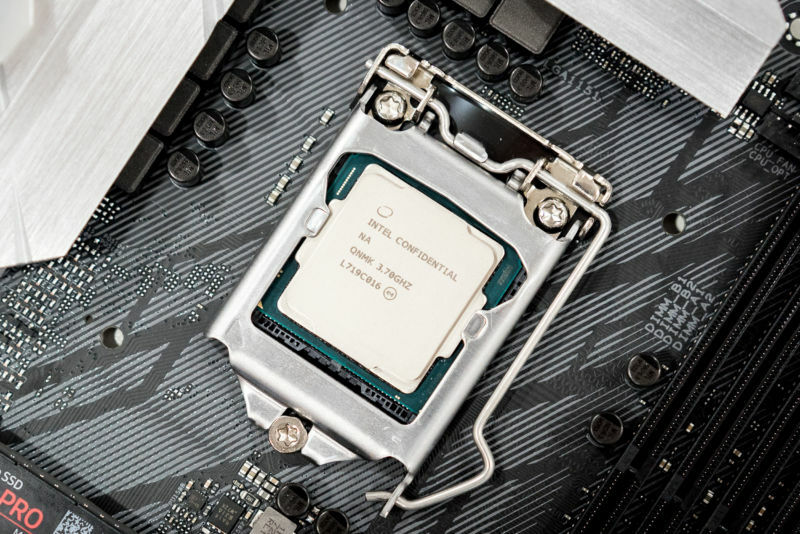 The i3-8350K in particular, which retails for around $170, could be a steal for budget gaming systems, especially when overclocked. There are games that benefit from more cores, but four still perform well, even in the latest titles. Internally, there’s little to tell Coffee Lake apart from Kaby Lake, which in turn was largely the same as Skylake. This one of the longest periods Intel has gone without changing its mainstream architecture, a side effect of the move away from tick-tock, and the delay to 10nm Cannon Lake parts. There is an extra 4MB of L3 cache on board to accommodate six cores, along with a rise in TDP to 95W, but otherwise don’t expect any increases in instructions per clock performance. The performance boosts in Coffee Lake come from clock speed and cores, not from an evolution in architecture. There’s little to report on the GPU side either. All Coffee Lake processors include Intel UHD 630 graphics (running at 1200MHz on the 8700K), the same Intel UHD 630 graphics included in Kaby Lake. For basic gaming—older games and e-sports—and media decoding and encoding, Intel’s integrated GPU works well. Everyone else should plan to purchase a discrete GPU. If, given the rapid rise in NVMe storage, you had hoped Intel might increase the amount of PCIe lanes on its mainstream processors, you’re out of luck. All Coffee Lake processors feature just 16 PCIe 3.0 lanes connected directly to the CPU, with another 24 lanes on the motherboard sharing a single DMI 3.0 (the equivalent of four PCIe lanes) connection. Admittedly, that covers most mainstream use cases—a single graphics card and NVMe SSD—but it’s a shame that there’s no scope for more complex NVMe storage setups, particularly as Ryzen offers an extra four lanes connected to the CPU for such scenarios. Despite the similarities between Coffee Lake and Kaby Lake, Coffee Lake requires a new chipset to function. At launch, that’s the Z370 chipset, an enthusiast product that supports overclocking along with other niceties like multiple M.2 slots and lots of I/O. According to Intel, the reason for the new chipset is to accommodate the increased power requirements of the six-core processors, which are indeed power-hungry beasts, although most high-end Z270 motherboards have over-engineered power delivery to begin with. Regardless, the Asus ROG Z370-E Gaming on test is a fine motherboard, which is reasonably priced at £200. It features two M.2 SSD slots (one of which is hidden underneath the chipset heat spreader); three full-length PCIe 3.0 slots and four PCIe 1X slots; four DIMM slots with support for up to 4000MHz DDR4 memory; USB 3.1 Gen 2; Intel I219-V gigabit Ethernet; Bluetooth 4.2; semi-8 Phase Power and an 8-pin connector for the CPU; and Asus’ typically over-engineered (but very much welcome) on-board ROG audio. It looks neat too, with a simple monochrome design. There is RGB lighting on-board for those that want it, along with a pair of RGB headers for connecting external strips and fans.As usual, there are a whole range of Z370 motherboards available at launch, with Asus producing a confusing 12, some of which are priced within just £10 of another. Two of those are at least in the micro-ATX form factor, while another is mini-ITX. Unfortunately, only high-end Z370 motherboards are available at launch. Cheaper H-series and B-series motherboards, which pair well with non-overclockable chips and the i3 range, won’t launch until early 2018. For now, those hoping to build a budget system have to wait.